It’s like any other day at work. 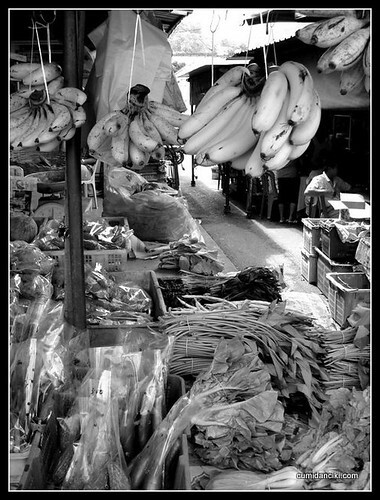 Only thing is instead of an air conditioned room, a desk and a computer, you are surrounded by stalls, rows of stalls selling vegetables, fruits, fish , chicken and meat. No wonder the place smells. Every morning this long and windy road fills up with stalls, starting from as early as 5 a.m. Later, at around 7 a.m. onwards things start to get busier and housewives will swarm in on the stalls like bees swarming over a honeycomb. Relentless. Pulsating. Droning. It’s where housewives trudge through each day, trying to fill their baskets with the freshest produce, so that they can cook something good for their families later in the evening. Here in this busy market, Mrs. Chong is trying to feed the baby in the high chair her oats. What an incongruous sight you say. A baby in a high chair right in the middle of a wet market. Mrs. Chong is only thirty seven years old but this is her fourth child. She has a boy aged 3, and two girls aged 7 and 8. Lin is her fourth child, a baby girl whom she is trying to feed at the moment. Tuk, her 3 year old boy is running round and weaving in and out of people’s way like he was born to be a grand prix driver. Later Mrs. Chong will put the baby to sleep in the makeshift sarong by her stall. Everyday, the two older girls come to the stall after school and help Mrs. Chong close up before heading back to their flat in KL. “It’s actually not difficult at all because my friends here at the neighboring stalls, they love children and they always help me keep an eye, when things get busy.. we can’t afford a babysitter, so it works out just fine”, says Mrs. Chong. 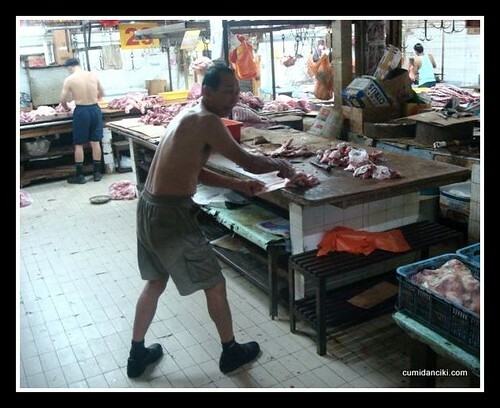 Mrs. Chong’s husband works as a pork seller in another market. A butcher. That’s not the best place for children, says Mrs. Chong. They hardly see their father because he works round the clock, prepping the fresh meat for the next day’s sale at the market. He used to be a technician but could not make a decent living. Now at least, between the two of us, there is enough to put food on the table! Mrs. Chong admits that this was not the life she had hoped for nor dreamed about , but it could be a lot worse. She tells me that her friends who “married well” have kids who are heavy into drugs and gambling. “I am lucky that God made me strong and gave me a beautiful family”. As long as I have my arms and legs and a strong heart, we will do just fine. 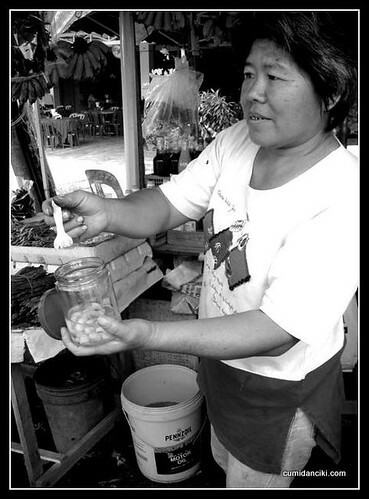 Footnote: This story is dedicated to a lady I met at one of the Malaysian wet markets, sometime late last year. Her resilience and positive disposition really touched me. I think if I were in her shoes, I would find it hard to be so contented. I think I’d have to dig deep to find the strength to persevere. For this I truly admire her. The names of the people in this post have been changed to protect their identity. yes, tell me about it. sometimes have one and u need to think twice! yea, but not everyone find it so easy to find the silver lining rite? LOL, so, this week we should all try harder.. including me! It’s a hard life but I salute them for going through these obstacles without giving up. As Chinese, we give our children the highest priority.. nothing else comes first! It’s in our DNA, our culture, our value! Whenever I met with difficulties, I always try to look at the bright side of life. Optimistic is the key.. as I always believe in “When the going gets tough, the tough gets going”. LOL, yes thule – you are one of the most optimistic people i know:) well done. and yes, family is ALWAYS first in our culture! I just came across your blog and I am so glad I did! This is so touching… thanks for sharing, dear. Reminds us to be vigilant about being grateful for what we have. There are different yardsticks for happiness. I like hers. Mei, this is a very interesting post! You’re not only writing about fancy food on a fancy restaurants, but also another side of the worker on the traditional market. Thank you! Thanks for your story. My first visit to Malaysia, then called Malaya was 1960. Early 1990 I was posted a few years to KL and it was a most interesting time. Looking back when reading the touching story, I realise that over all the years not much has changed with wet markets. A funny thing I will never forget, there is a vegetable called ‘lady finger’ which I always liked. Who knows more about it? hola federico, wet markets are a fantastic place to observe the local life. Lady’s fingers is also commonly known as okra. Mostly grown in the tropics or warm temperates. We like fried okra! CAP-SQUARE.. the latest swanky, wine and dine and hangout place to be. It’s strategic location finds it right at the heart of the matter….